What, are we supposed to believe that 45-65 year old males who make 60-80 make up 23% of the population? What a joke. Are you talking about the population? I was talking population, because of the implicit assumption that an established pollster would adjust their sample to reflect the population. They obviously didn't do that in this case, if one specific demographic alone (45-65 y/o men who make 60k-80k) is carrying 23% of the total vote (half of the Cons supposed 46% is from this demographic). Nanos and Forum were probably herding! Who knew! Forum Research have disgraced themselves in numerous elections, as I already explained above. They are also using a discredited IVR polling method. Nanos is the only traditional pollster left and their record has been impeccable so far. The following information is not my opinion. It's just the publicly available numbers. Read Forum's own release about incoming Wildrose majority on the day before the election. But I guess in NR's view, everything is an opinion and everyone is engaged in propaganda. Not everyone is exactly like you, NR. You have been sharing your erroneous opinions that Nanos is the only Pollster worth following which is utter nonsense. Nanos has completely blown it on the Ontario election, and federally in 2015 they were out of it, until their final poll, as discussed today on the tooclosetocall website. Nanos probably were herding which you have not taken into consideration. All pollsters claim their polls are the most accurate and they take turns being the closest or furtherest away to the actual results. Nice job completely ignoring the facts about Forum Research, which is unsurprisingly your favorite pollster. I suppose they play right into your "truth is an opinion" mentality. You're making no sense on Nanos. First of all, the Ontario election has not happened yet. Secondly, you are comparing newest Ontario polls to a Nanos poll which was released 2 weeks ago, but was actually completed 3 weeks ago. It's also not surprising at all that OLP voters would be less likely to "volunteer" for online polls and IVR polls. As for the last Federal Election, Nanos was spot on and they had the Liberals leading 18 days before the election. And it was still the only live telephone pollster. Other pollsters, which are online or IVR, were likely "weighting" their raw data in accordance with an actual pollster. And didn't we already address your often repeated argument about pollsters' claims? Focus on the numbers, not on marketing material. Forum has been a significant outlier in favor of the Cons since January, and that has not changed. Just look at the first page of this very thread. Considering Forum's major embarrassements in past elections, I wouldn't make any predictions based on their polls. While the media coverage of the Ontario election is bound to have some impact on the federal numbers, I doubt it will still be there in 2019. Everyone is aware that Trudeau has been stumbling. India, Kinder Morgan, etc. And the Nanos polls are just reflecting it. Despite NR's sudden enthusiasm about Nanos polls, there's nothing great about that poll for the NDP, nor for the progressives a whole. So the Ontario election had a effect on federal polling, who knew? Is that a political shift that's going to last until 2019, or it is just a reflection of the Ontario media coverage? I suspect it's the latter. Much like the "India debacle", it's a reflection of the media coverage looking back at you. Best thing to do when you are wrong, is to admit it. India and Kinder Morgan will not really move anyone's vote, and neither will the Ontario election. Even if Ford wins, his honey moon will be over real fast, once nothing gets done under his watch. I completely stand by my statement on Forum Research. I've been saying all along that the Ontario election will have some impact on the federal polling numbers. But that has no connection with the outlier polls Forum has been producing since January. They remain outliers today. As for Nanos, the 3% Con lead is within the margin of error, and does not come remotely close to Forum's numbers. NR suddenly is citing Nanos. Because his rule is that polls that show Liberals behind are valid polls. Polls that show ahead are inherently biased. Yes, and apparently the India trip and the Ontario provincial election are fundamental issues which will decide the federal election in Oct 2019. If Trudeau is outpolling his party, that means the Liberal brand was somewhat damaged by media coverage of the Ontario election campaign. Furthermore, some poll respondents probably don`t differentiate between federal and provincial politics. I suspect this is a temporary effect, much like the effect caused by media coverage of the India trip. Live by the polls, die by the polls. The shoe's now on the other foot. Liberals are the spoilers in Ontario. You can either rail at the polls or get behind the party with the best chance to deny Ford the premiership. and I can pull out half dozens articles that are on this site (babble) right now that has offered data that strategic voting doesn't work. But, but...... how can that be! Good for Innovative Research for being able to assemle a representative online panel. A significant portion of the electorate is simply not online or would not participate in on-line polls, as confirmed by multiple past blunders of on-line pollsters. Live telephone pollsters just don't have the same spotty performance records as on-line and IVR pollsters do. I'm not saying it's impossible to have a representative online sample, but it's less likely than live telephone polling. Some pollsters, such as Forum and Mainstreet, have particularly bad records, but they are usually IVR, i.e. automated calling. The ONDP better hope Forum Research is bogus as usual, as today they have Ford pulling ahead again 39% to NDP's 35%, which is apparently down from 47% in their previous outlier poll. Their next poll will have Andrew Scheer leading the Ontario election. Nice seeing the NDP numbers recovering. Looks like it is coming at the expense of the Liberals. The pipeline purchase could be hurting him. But not as much as the Ontario election, I suspect. With such a terrible leader according to so many here at babble, the Singh-led NDP remarkably is at 22%, and within 13% of the Liberals. So who is wrong, the NDP critics here, or Nanos? Nanos will release a full report tomorrow, I think. It will contain "Best PM" numbers. We'll see how well Singh does. Keep in mind that this poll is a actually a week old, before the Ontario election took place. Nanos, or the NDP critics here, or both? The NDP brand got a boost from the Ontario election as the only opposition to Ford. It's unlikely to be connected to Jagmeet Singh. The Best PM numbers are on the second page. It won't be until next week's poll that shows the full impact of Trump. Those who think 22% is a great position for the NDP. 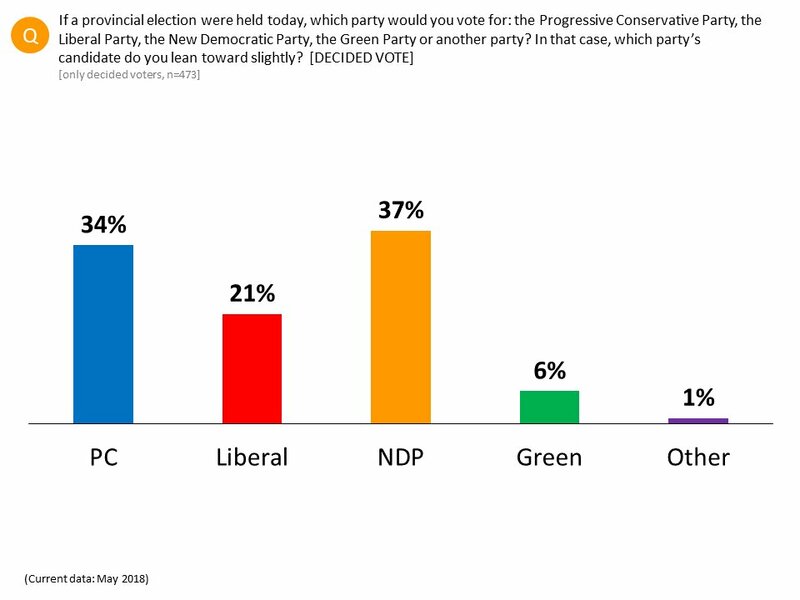 NDP is ahead of Libs. And thats the only thing that matters. Jagmeet should start picking his shadow cabinet. 22% for the NDP That's the highest Nanos has had the NDP since prior to the last election. Yea, Singh must be a dud for this to happen! If nanos says it is 22,its probably close to 32. Official opposition numbers, and there is still time to 2019.